To build new Div station at Mill St Bradford near Hyde Rd Redgate St to replace Lowe St PS and Belle Vue St PS. 23rd Feb 1899 Concern recorded regarding the costs of prisoner conveyance between the City Courts and Police Stations - £555 by private tender of Messrs Richmond and Sons. Further concern over building stables at Fairfield PS when the railway company plans to buy Fairfield St PS and the proposed more central ‘C’ Div HQ PS [Mill St]. 6th April 1899 ‘Proposed Police Station on the ‘C’ Division'. WC recommend the closing of Brook St PS and Openshaw PS and the building of a new police station in Mill St Bradford. The LUSC are authorised to conduct negotiations for the purchase of land. 27th April 1899 Special sub committee report regarding the purchase of land at Bradford. Land at 3½d. / sq yd chief rent, and paving charges quoted by Capt Parker’s Trustees. Council resolve to pay only 3¾d. chief rent including paving and the water course to be diverted from underneath the land. 6th July 1899 Solicitors for the land owners request interest at £194.12.0d paid out to pave at 4% as standard in such cases and they cannot entertain under 4d. for the chief rent. Final agreement to 3¾ d. chief rent and the Corporation to repay the sum paid out by the Trustees on paving at 4% p.a. 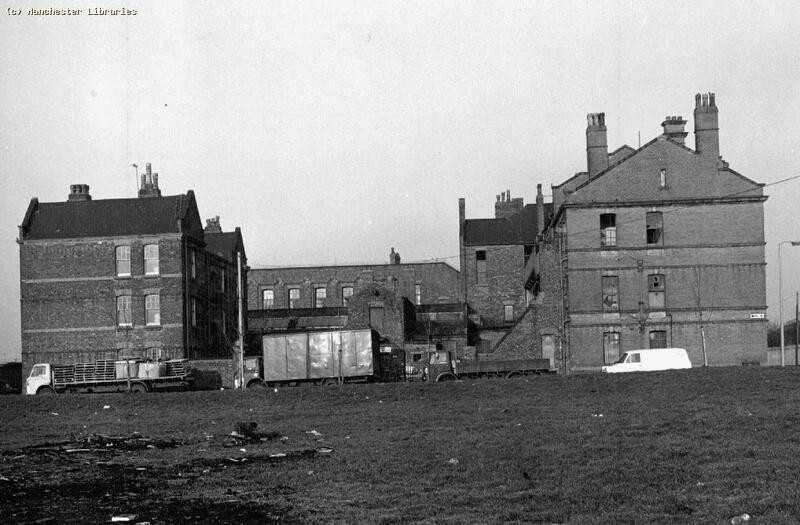 14th Sept 1899 Purchase of land at Mill St bounded by Brownhill Street Buttermouth St Ryhl St. Lease for 999 years from Capt Parker’s Trustees of 5022 sq yards. 28th Sept 1899 Authorised to buy land at Mill St.
19th Oct 1899 Covenants to be agreed, bar the fire insurance clause (considering the use of the land as a fire station as well) but building to commence within two years not three months. The Mill St PS should now be pushed forward closing Brook St and Openshaw PS the later being let to the Openshaw Board of Guardians. To have a new station near Cornwall St [the future West Gorton PS on Ashton Old Road]. 26th July 1900 Purchase of land at Bradford for a Police and Fire Station: Preparation work by the Trustees commenced as to the diverting of the brook. Purchase cost of the ground £3,000 and resolved to request the Local Government Board for a loan. 16th Aug 1900 The Mill St Sub committee to report to the WC current position. 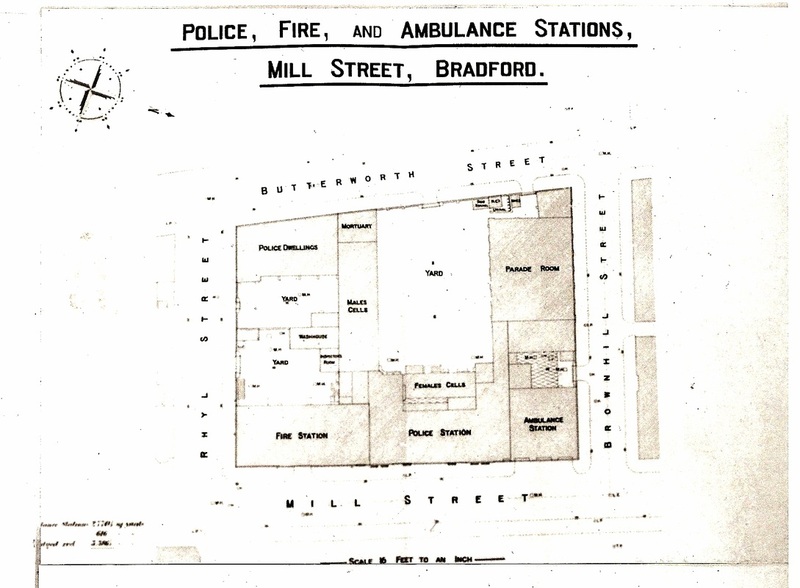 30th Aug 1900 Sketch plan of the new Police and Fire Station Bradford – Fire Brigade to front onto Mill Street. 13th Sept 1900 Plans submitted to cover 2044 sq yards at £2410. 28th Feb 1901 Resolved to obtain form the Local Government board the following loans: £22,000 for the Police Station and £6,000 for the Fire Brigade. 2. Cross section plans of the cells required to see air inlets and ensure they are not placed on the floor where dirt and other matter could be introduced by prisoners. 3. 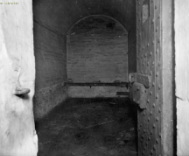 Details were required of the cell doors with regard to food hatches and inspection eyes. 5. 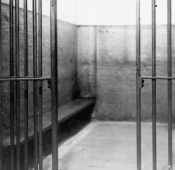 Double beds shown when it was understood that not more than one prisoner in each cell therefore single beds should be provided. [Unlike Newton St where two single beds in each cell are provided]. 1. Ventilation hatches: they should be 54 superficial inches and the heating grate near the top and the extraction near the bottom should be as afar apart as possible. 2. Bell communication between prisoners and constable should be provided [as seen in Newton St cells]. W.C resolve to comply with all the conditions. 15th May 1901 Quinquennial Valuations: Mill St site £2,487 and FB site £513. 8th June 1901 Plans for the station approved by the Home Office Surveyor of Prisons. The City Surveyor to obtain tenders for the building. 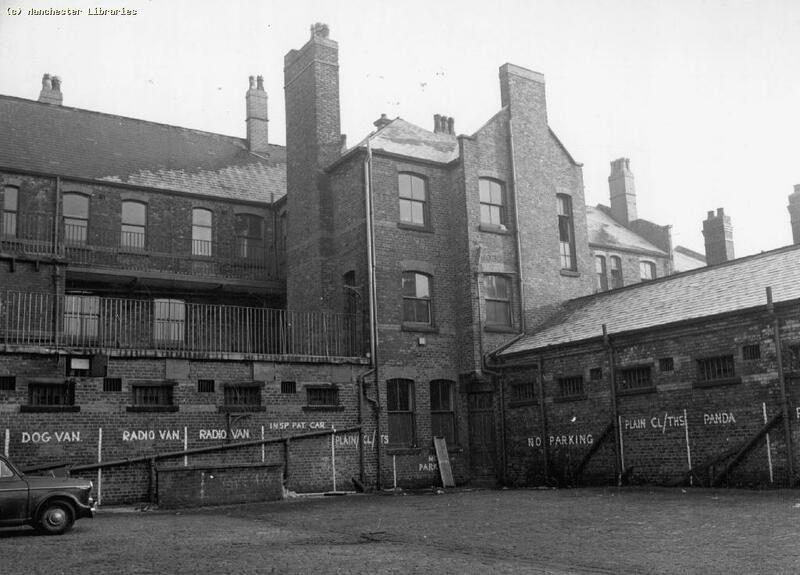 25th July 1901 Local Government Board approve the amounts of £22,000 and £6,000 for the building of the police station and fire station at Mill St. They note however the skylight in the mortuary should not be positioned to allow direct sun rays to enter the mortuary. Plans approved by the Secretary of State. 14th Nov 1901 To appoint a Clerk of Works for Mill St.
9th Jan 1902 Additional amount for the erection of the Police and Fire station at Mill St at £4,500. 1. Extra depth of foundations due to the bad nature of the ground. 2. Partial removal and filling up of an old culvert under the site. 3. Formation of cavity walls as shown on the drawings estimated at £500. 4. Rights of light mean construction of six window areas at the station for £6 each. 16th Oct 1902 Fair progress reported at Mill St.
2nd July 1903 Fairfield St still under W.C control and Mill St not now ready until August. The L.N.W.R. Co are now requesting rent from the W.C on the Fairfield Rd site. 22nd Oct 1903 Sale of the Fairfield Rd site to L.N.W.R. Co finalised. 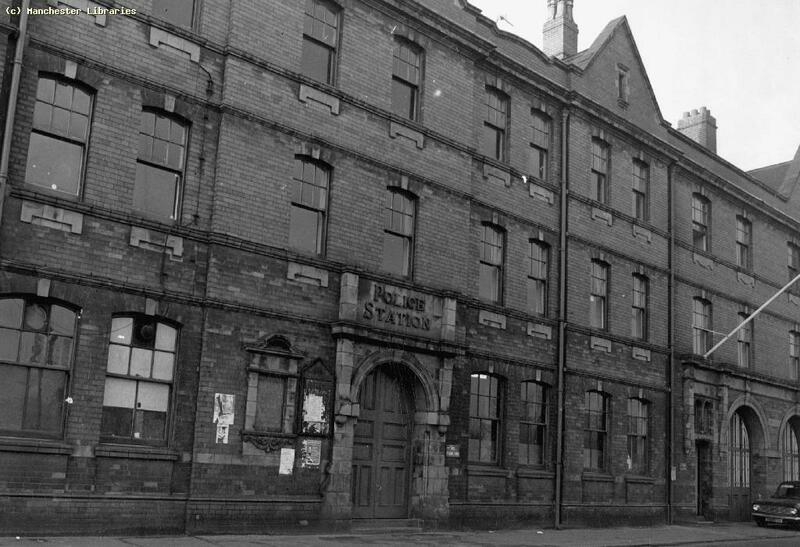 Dec 1978 Closure of Mill Street and opening of Grey Mare Lane Police station nearby: ex PC Mike Wilson.